Discussion in 'iPhone and iPad Games' started by touchy85, May 11, 2016.  A brand new level you can finish every day!  Set in a different location every day!  Everyone will have exactly the same level every day!  Different traps every day!  Different monsters every day!  Did we get across there's a ton of new stuff every day?  Simple one touch gameplay in portrait orientation. A perfect platformer on the go!  A colourful and stunning pixel art world. Retro nostalgia is a go! 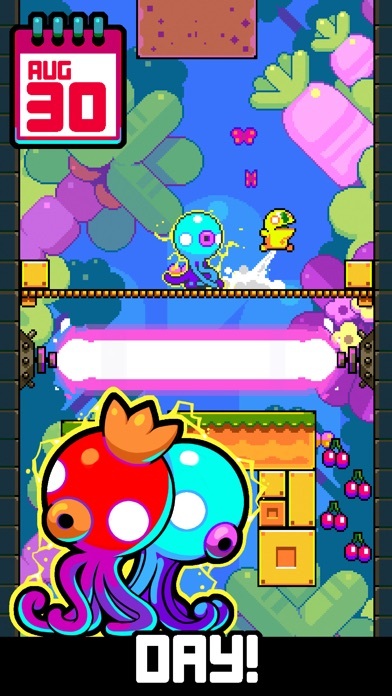  A real labour of love from the whole Nitrome team! 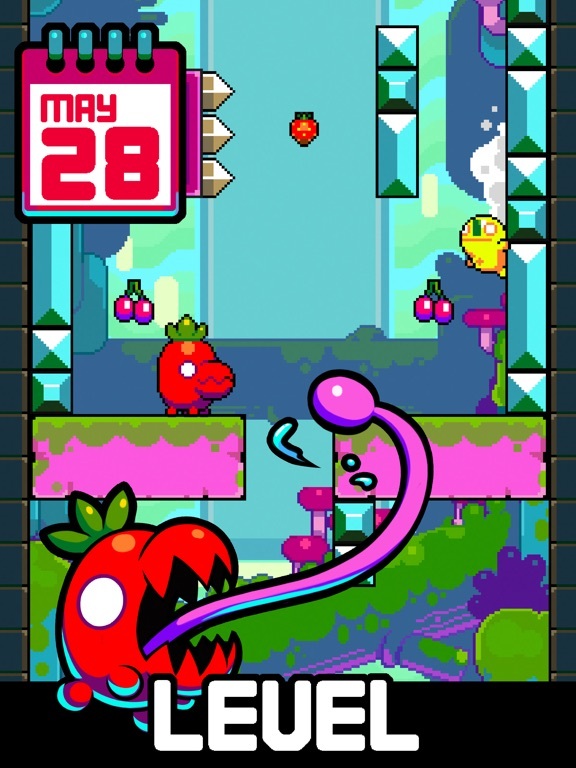 Leap Day is a fast paced action platformer with a brand new level every day! ...no really EVERY DAY! ...like until the END OF TIME! **Top 10 Appstore game of the year 2016** Features: • A brand new level you can finish every day! • Set in a different location every day! • Everyone will have exactly the same level every day! • Different traps every day! • Different monsters every day! • Finish the day and get a gold trophy stamp on your calendar... every day! (As long as you're good enough!) • Did we get across there's a ton of new stuff every day? Also: • Simple one touch game play in portrait orientation. A perfect platformer on the go! • A colourful and stunning pixel art world. Retro nostalgia is a go! 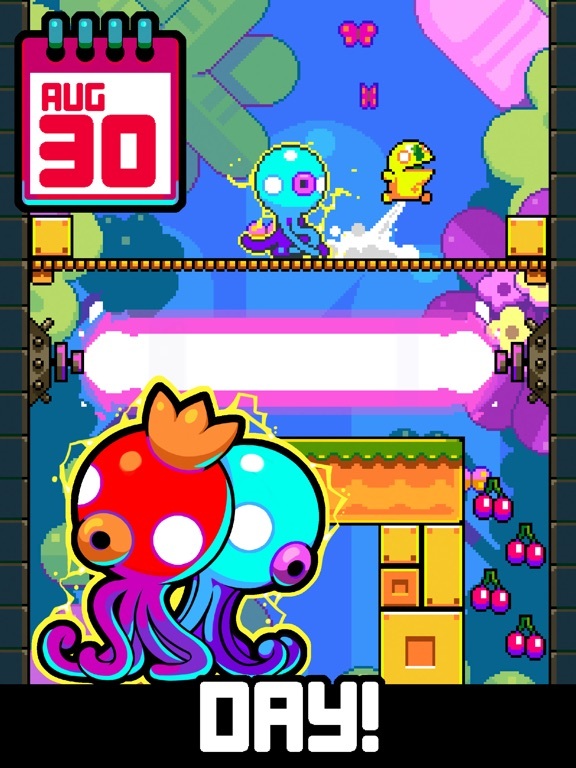 • A real labour of love from the whole Nitrome team! 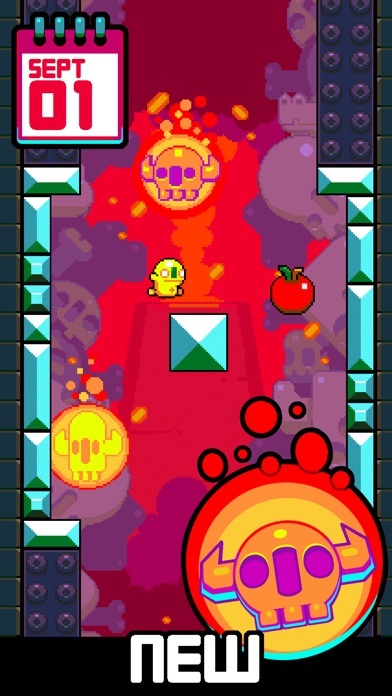 -Important information- This game contains third party advertising and cross promotion for other nitrome games, both which can be removed via a one time In App Purchase. You're going to get 1 level each day. 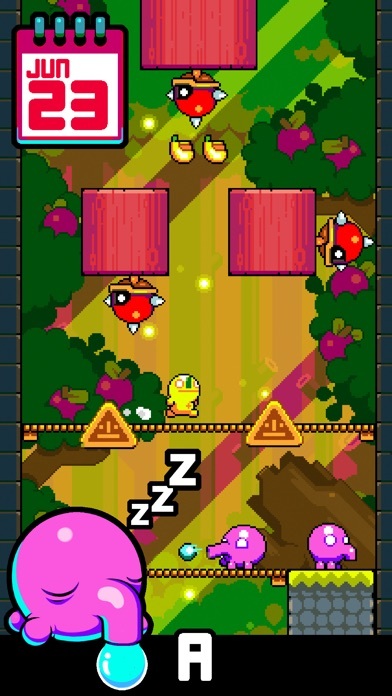 It has the Nitrome mark of quality and this is a really good one touch platformer. There are around 20 segments in each level and you can decide to go on to the next level or buy a checkpoint with soft currency or by watching an add. There's a IAP to get rid of the ads, I don't know how much it costs because I literally can't find the IAP menu. If you play this game without the iap, you're going to get bombarded by ads. Every 3 times you die, you're forced to watch an add, you can skip them after 5 seconds. And you're going to die a lot. If you're on one of the harder segments of the level, you're pretty much going to die after 10 seconds if you're as bad as me. 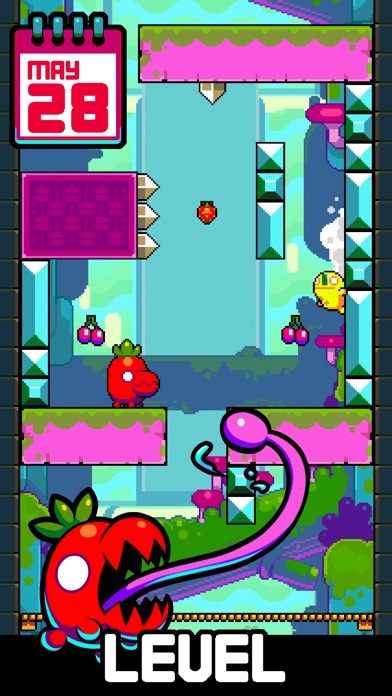 But if you buy the iap, there's a really good platformer that you're going to play for months. I can't recommend this enough. 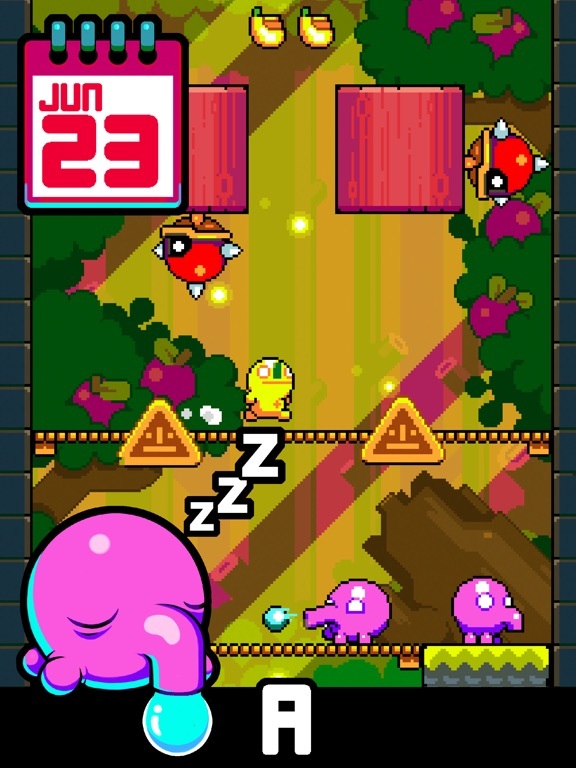 I've become very attached to Rust Bucket, but this may very well be Nitrome's best app...ever. Do yourselves a favor, buy the premium IAP for $3.99 and basically never ever delete this. One level every single day for all of eternity? YES PLEASE! What separates this from other games that have tried this (1000 Heroz, anyone?) is that the game play's actually fun. In fact, it's damn near flawless. We're talking super lengthy levels too! 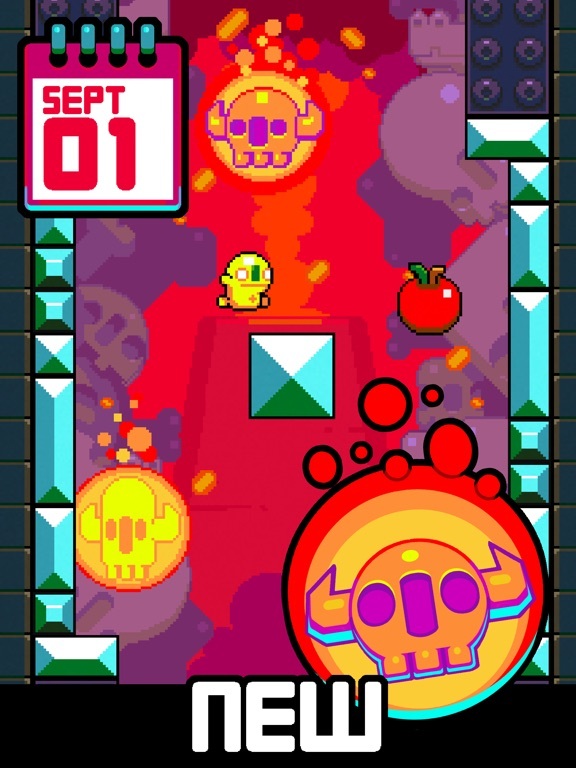 Nitrome, one tiny request (if it's already not implemented? ): This may be the only time I ask this, but could you implement push notifications (obviously something we'd have to accept) to know when a new level is up? Not sure the Push Notification is a good idea? You would really want a daily push Notification at Midnight every day? Glad that people seem to be enjoying the game so far. We will be following this thread so if people have questions or feedback we will be listening. Haha, when you put it that way....ummmmm, it could be the cause of severe backlash. Forget it. Looks great! Love the old school quarter-munching arcade vibes. Downloading! Many games do this. That's what Do Not Disturb mode is for. Or silent mode. Or just turn off the notification sound. Or you can have them pop at 7 or 8 in the mornings. That's not a bad idea at all. You could even have them pop up at 12 PM and be all "Hey, have you checked out today's new level yet?". This is a superb game, if they can bring a new level each day I think this will stay on my phone for a long time. Regarding notifications, I always think that apps like this should have a notification in the afternoon IF you haven't checked out today's level yet. Most of the time I'll play them in the morning, but sometimes I'll forget. I only have one other minor request: can the Settings icon be replaced with a Quit to Menu icon, or actually open a Settings screen? It's frustrating to be booted back to the menu with no warning when you're trying to check the sound settings. How does the level a day work? 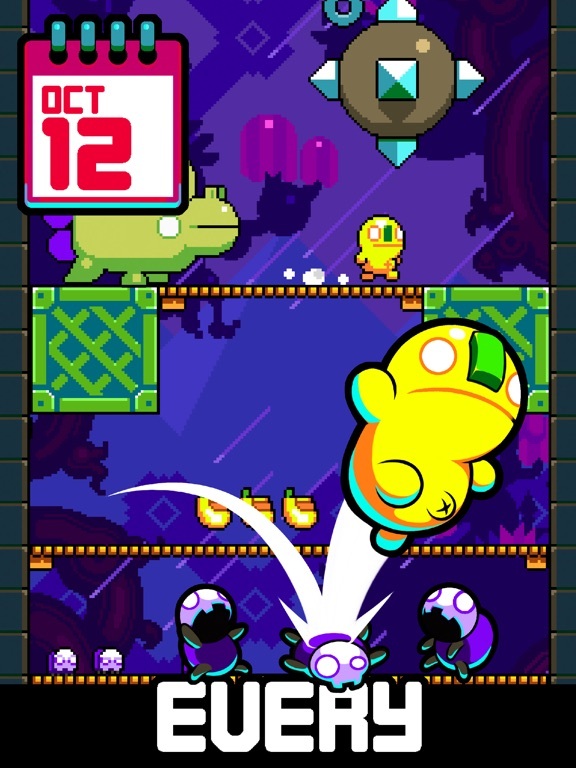 Is it generated by the game so it will go forever without Nitrome support? When I hit the check points I'm unlocking chests with fruit or an ad but nothing ever comes out of them? Maybe I'm missing something though. You're unlocking the actual checkpoints when you either watch an ad or spend your fruit. If you don't do so, you won't be able to continue off when you die. The $3.99 premium IAP unlocks all checkpoints and gets rid of ads. If you dig the game, I highly suggest you invest in that IAP. One level a day - the clock on top runs out exactly at midnight, at least here CET (central european time). Perfect with me. Always nice to have a setting option though, for those who really need it. Since i had enough time to dive deep into this first level (no chance to fully complete without dying though), i feel a bit underwhelmed. I wanted more, i wanted to game on, but i couldn't...hmm. I've yet to see how this turns out for me in the long run. 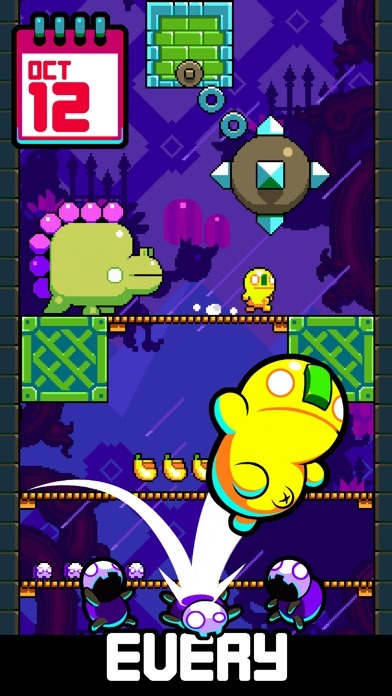 Gameplay, art style and controls are the usual Nitrome suspects - adorable perfectly executed. My four bucks switched accounts as usual, too. For the first time in a Nitrome game (i guess), i wished me a volume slider for the music. It's a tad to loud for me. Btw, i'm glad i got used to it. Absolute no love at first hear. Wonderful game, great gameplay and beautiful art. Yep, my first impressions echo these and Mr. Casket's. I've only played for five minutes or so and reached the 3rd or 4th checkpoint, but one really cool touch I noticed was a sort of preview of tomorrow's level in the background of the current level. Good stuff.